For other people named David Stern, see David Stern (disambiguation). David Joel Stern (born September 22, 1942) is an American businessman and lawyer who served as the fourth commissioner of the National Basketball Association. He started with the Association in 1966 as an outside counsel, joined the NBA in 1978 as General Counsel, and became the league's Executive Vice President in 1980. He became Commissioner in 1984, succeeding Larry O'Brien. He is credited with increasing the popularity of the NBA in the 1990s and 2000s. Stern has served on the Rutgers University Board of Overseers and is a Chair Emeritus of the Board of Trustees of Columbia University. He is also a member of the Council on Foreign Relations. On October 25, 2012, Stern announced that he would step down as NBA commissioner on February 1, 2014, 30 years to the day after beginning his tenure as commissioner. His deputy, Adam Silver, was his successor. At the time of his departure, he was the NBA's longest-serving commissioner. Stern received the Olympic Order in 2012. On February 14, 2014, the Naismith Memorial Basketball Hall of Fame announced that Stern would be a member of its 2014 induction class. In 2016, he became a member of the FIBA Hall of Fame. 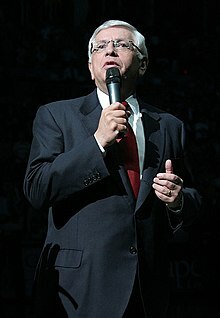 David Stern was born on September 22, 1942 in New York City. He grew up in Teaneck, New Jersey in a Jewish family, and is a graduate of Teaneck High School. Stern attended Rutgers University, where in 1960 he pledged to the Sigma Delta Chapter of Sigma Alpha Mu Fraternity. He graduated as a history student in 1963, graduated from Columbia Law School in 1966, and was admitted to the bar in New York later that year after passing the state's bar examination. Stern's first affiliation with the NBA came in 1966 when he was hired at Proskauer, Rose, Goetz & Mendelsohn, LLP, the law firm that represents the league. He was the lead attorney representing the firm in the case of Robertson vs National Basketball Association, the landmark lawsuit brought against the NBA by star player Oscar Robertson. Stern helped the league negotiate a settlement that allowed the NBA/ABA merger to proceed in return for the NBA abolishing the "option" clause in its uniform player contract and allowing players to become free agents for the first time. In 1978, Stern left Proskauer Rose to become the NBA's General Counsel under Commissioner Larry O'Brien. By 1980, he was Executive Vice President of the NBA. During this time, two landmark decisions were reached with the NBA Players' Association: drug testing and team salary cap. The drug testing dealt with the perception that most basketball players used drugs, that the NBA admitted it had a problem, and it was cleaning it up. The salary cap created a revenue-sharing system where owner and player were effectively partners. Both of these agreements solidified Stern's standing inside NBA circles. On February 1, 1984, Stern became the Commissioner of the NBA, succeeding Larry O'Brien. It was during that same year (1984–85) that four of the league's marquee players during the 1980s and 1990s—Michael Jordan, Hakeem Olajuwon, Charles Barkley, and John Stockton—entered the NBA. The arrival of Michael Jordan, in particular, ushered in a new era of commercial bounty for the NBA. With him came his flair and talent for the game, and that brought in shoe contracts from Nike which helped to give the league even more national attention. Jordan and the two other premier basketball legends of the 1980s, Larry Bird and Magic Johnson, took the game to new heights of popularity and profit. By 2004, Stern oversaw the NBA expand from 10 to 30 franchises (since 1966), expand into Canada, and televise games in countries around the world. Stern also oversaw the creation of the WNBA, a professional women's basketball league. Stern has been credited for developing and broadening the NBA's audience, by setting up training camps, playing exhibition games around the world, and recruiting more international players. The NBA now has 11 offices in cities outside the United States, is televised in 215 countries around the world in 43 languages, and operates the Women's National Basketball Association and the National Basketball Development League under Stern's watch. Stern has been at the center of multiple controversies during his time as commissioner, with a noticeably more frequent trend in the later years of his tenure. During the 1985 NBA Draft Lottery, the NBA used a system where seven envelopes representing the seven teams with the worst records were mixed in a tumbler, and then drawn by Stern one at a time to determine which of these clubs would get the 1st pick onwards up to the 7th pick. When these envelopes were added to the tumbler, two envelopes were put in forcibly, and banged against the edge, while all the rest were set in gently. When drawing the envelope for the 1st pick, Stern went for the one with a bent corner, which upon opening the envelope, it was revealed that the New York Knicks logo was inside. This fueled speculation of a draft fix, with the theory being that the NBA wanted to send the best player in the draft to New York to increase ratings in a large television market. In the 1997 NBA playoffs, the NBA suspended five players following a brawl between the New York Knicks and Miami Heat, which affected the outcome of that series. Some of the suspensions were required by a league rule, implemented under Stern, that provides an automatic one-game suspension to any player who leaves his team's bench during a fight. In the 2007 Playoffs from the Suns-Spurs Game, several players who left the bench and were not involved in the altercation were also suspended, prompting complaints from officials on both teams. In 2000, it was revealed that the Minnesota Timberwolves had tampered with Joe Smith two years earlier by promising him a more lucrative contract in future years in exchange for signing him below market value so they could sign more players in the short-term. The NBA voided the last year of Smith's contract, fined the franchise $3.5 million and took away the Timberwolves' next three 1st-round NBA Draft picks. Although many believed that tampering is a common practice, Stern abided by arbitrator Kenneth Dam's ruling that the Timberwolves had signed the secret agreement, and denied that the league was making an example of the Timberwolves. Before the 2005–06 season, the NBA announced a new dress code, which banned players from wearing headphones, chains, shorts, sleeveless shirts, indoor sunglasses, T-shirts, jerseys and headgear such as baseball caps during NBA-related public appearances. Allen Iverson criticized the policy: "They're targeting guys who dress like me, guys who dress hip-hop ... I think they went way overboard." For the 2006–07 season the NBA introduced a new "microfiber" basketball for use in NBA games, replacing the previous style ball used since 1970. Dallas Mavericks owner Mark Cuban agreed with the need for a new ball, claiming the old style ball was inconsistent. Many of the league's most prominent players openly expressed their dislike for the new ball, such as Shaquille O'Neal who said, "Feels like one of those cheap balls that you buy at the toy store." A study, financed by Cuban, claimed that the new ball "bounces 5 to 8% lower than typical leather balls when dropped from 4 feet...[and] the new ball bounces 30% more erratically." However, Stern initially refused to go back to the original ball despite many complaints by players about the new ball. Two months into the season Stern stated that the new ball may have been a poor choice and poorly tested and "we could've done a better job". On December 11, 2006 the NBA announced that it would in fact switch back to the leather ball starting on January 1, 2007. In 2007, Stern injected himself in the controversy surrounding the purchase and subsequent relocation of the Seattle SuperSonics by Oklahoman Clay Bennett and his ownership group. His support for the surprising move from the nation's 14th-largest market to the 45th was questioned by many both in the public and media. Stern also led the NBA to intervene against a 2008 legal attempt by Howard Schultz to keep the team in Seattle. Additionally, leading up to and lasting throughout the 2010–11 season, Stern and Deputy Commissioner Adam Silver made a number of statements regarding the drafting of a new collective bargaining agreement for the 2011–2012 season. During the All-Star game in Los Angeles, an open meeting between players and owners was held over the agreement, with David Stern quoted as saying that he "[knew] where the bodies are buried" in the NBA, because he had buried them himself. This raised eyebrows in the room, including that of all-star point guard and eventual MVP, Derrick Rose, who shared his disbelief with fellow reports." I just stopped and thought, ‘Whoa ...’" Rose said. "I couldn’t believe that he said it." This statement, coupled with others, served as a prelude to the labor dispute and later set the stage for a player lockout on July 1, 2011 that would last for five months. On December 8, 2011, Stern vetoed a three-team trade that would have sent Chris Paul to the Lakers, Lamar Odom to the league-owned Hornets, and Pau Gasol to the Rockets for what a spokesman would only say were "basketball reasons". Early reactions from around the league, fanbase, and media were all largely negative, with players taking to Twitter to express their concerns, and several noted sports journalists criticizing the decision. The deal was maligned especially because of the conflict of interest posed by the league's ownership of one of its teams. In an interview with ESPN, then Lakers coach Phil Jackson noted that league ownership of the Hornets could be particularly troublesome in the event that Chris Paul requested a trade. In the aftermath of Stern's veto, Jackson stated "If you create a situation like that, the problem might arise and it certainly did.". Sports columnist Bill Simmons decried the move as the league "intentionally jeopardizing its own credibility" and called the league's ownership of the Hornets "the biggest conflict of interest in sports history.". The decision came immediately after a deal to ratify a new collective bargaining agreement for the next decade was finally reached. Ostensibly, one of the aims of the agreement was to bring parity to the 30 teams in the NBA, while still facilitating player movement. The feeling amongst many was that the commissioner was pressured by the league owners who shared collective ownership of the Hornets and did not want to facilitate a trade in which the Lakers would receive a star player of Paul's caliber. In 2012, Stern was involved in a controversy with sports talk show host Jim Rome. During an interview, Rome asked Stern about the conspiracy theories that the NBA Draft Lottery was fixed in favor of the New Orleans Hornets (now Pelicans), and he asked, "Was the fix in for the lottery?" Stern replied with two answers: "Number one, no; and a statement, shame on you for asking." He then proceeded to ask Rome, "Have you stopped beating your wife yet?" and accused Rome of "making a career out of cheap thrills". This led to a heated exchange between Rome and Stern, ending when Stern said he had "to go call someone important like Stephen A. Smith." On November 29, 2012, San Antonio Spurs head coach Gregg Popovich sat out Tim Duncan, Tony Parker, Manu Ginóbili, and Danny Green for a nationally televised game against the Miami Heat. Popovich has frequently sat out his starters on road trips over the years in order to ensure they have enough rest for the playoffs, the Spurs are one of the oldest teams in the league. Stern was outraged when he learned of this, and said on the night of the game that the Spurs' actions were "unacceptable", and that "substantial sanctions [would] be forthcoming." On November 30, Stern fined the Spurs $250,000 for what he called "a disservice to the league and the fans." According to Stern, Popovich had not informed the Heat, the league or the media in a suitable timeframe that the four players were not making the trip to Miami. Stern's decision was criticized by commentators such as Adrian Wojnarowski of Yahoo! Sports, who said, "Stern doesn't care about the realities of his league, just the appearances. To him, the appearance on Thursday night was that Popovich had tried to embarrass him on national television and that's why the commissioner tossed that tantrum." Wojnarowski has argued that Stern has generally shown a pattern of bias against the San Antonio Spurs, while giving considerable leeway to the New York Knicks for their violations of league policy. Stern is married to Dianne Bock Stern, and they have two sons: Eric and Andrew. They reside in Scarsdale, New York. ^ "David Stern Celebrity". TV Guide. Retrieved November 24, 2014. ^ "From Corned Beef To Caviar". Sports Illustrated. June 3, 1991. ^ David J. Stern, National Basketball Association. Retrieved September 3, 2007. ^ "David Stern has date for retirement". ESPN.com. ESPN. 25 October 2012. Retrieved 25 October 2012. ^ "Five Direct-Elect Members Announced for the Class of 2014 by the Naismith Memorial Basketball Hall of Fame" (Press release). Naismith Memorial Basketball Hall of Fame. February 14, 2014. Archived from the original on April 12, 2013. Retrieved February 15, 2014. The New York State Unified Court System prohibits direct links to its site from external websites. ^ Halberstam, David (1999). Playing for Keeps: Michael Jordan and the World He Made. Random House. p. 120. ISBN 0-7679-0444-3. ^ Burns, Marty (2002-05-07). "In terms of dollars, Jordan was NBA's real MVP". Sports Illustrated. Retrieved 2007-07-20. ^ DuPree, David. "NBA Finals are whole new world", USA Today, June 14, 2005. Retrieved September 3, 2007. ^ a b "David J. Stern". NBA.com. 2007-11-09. Retrieved 2011-01-10. ^ Mahoney, Brian (May 18, 2009). "Griffin the big gift at lottery's 25th anniversary". USA Today. Retrieved May 20, 2010. ^ "ESPN.com - 2002 NBA Draft: NBA out to prove conspiracy theorists wrong". Sports.espn.go.com. Archived from the original on 2012-11-04. Retrieved 2012-10-26. ^ ESPN.com - GEN - Joe Smith was worth all this trouble? ^ "Stern: T'wolves put franchise at risk". CNN. ^ "NBA dress code upsets black stars". BBC News. October 31, 2005. ^ Mahoney, Brian (October 31, 2006). "Study: New NBA ball performs differently". USA Today. ^ Robbins, Liz (December 6, 2006). "A Whole New Game Ball? N.B.A. Admits Its Mistake". The New York Times. ^ Roscoe, nance. "NBA to ditch new ball, return to old", USA Today, December 11, 2006. Retrieved September 3, 2007. ^ Thiel, Art (April 20, 2008). "Stern and Bennett: Scoundrels must be held accountable". Seattle Post-Intelligencer. ^ Wojnarowski, Adrian (2011-03-21). "NBA players' union leader takes bold stand — NBA — Yahoo! Sports". Sports.yahoo.com. Retrieved 2012-10-26. ^ "Los Angeles Lakers deal to acquire Chris Paul off — ESPN Los Angeles". Espn.go.com. 2011-12-09. Retrieved 2012-10-26. ^ Wojnarowski, Adrian (2011-12-09). "Teams still pushing for Paul trade — NBA — Yahoo! Sports". Sports.yahoo.com. Retrieved 2012-10-26. ^ Berger, Ken (2011-12-09). "Nixed Paul deal makes NBA look like second-rate bush league — NBA — CBSSports.com News, Scores, Stats, Fantasy Advice". Cbssports.com. Retrieved 2012-10-26. ^ a b "Bill Simmons laments how far the NBA has fallen in the wake of the Chris Paul situation". Grantland. 2011-12-08. Retrieved 2012-10-26. ^ a b "Phil Jackson predicted Chris Paul trade issues a year ago — ESPN Los Angeles". Espn.go.com. 2011-12-14. Retrieved 2012-10-26. ^ "David Stern and NBA owners look vindictive and petty in veto of Chris Paul trade — ESPN". Espn.go.com. 2011-12-09. Retrieved 2012-10-26. ^ David Stern: Sanctions coming. ESPN, 2012-11-30. ^ Spurs fined $250,000 for 'disservice'. ESPN, 2012-11-30. ^ a b "David Stern stumbles again in his failed culture war against the Spurs, fines franchise $250K". Yahoo! Sports. 30 November 2012.